Cage Championships gets back to the basics in Sullivan on Saturday. The promotion that has seen local MMA superstars Lance Benoist and Matt Ricehouse pass through its doors is returning to its ammy roots after a successful run of pro/ams in 2012. The man behind Cage Championships, Patrick Smith, looks to take some time off from putting together pro fights in order to help build up the area's talent base. Cage Champs pulls talent from the areas southwest of St. Louis and as far south as Fort Leonard Wood, and as far west as Jefferson City. "I'm not done with pro fights. We got some exciting things planned," Smith said. "Right now, we're focused on building the underside of those cards." 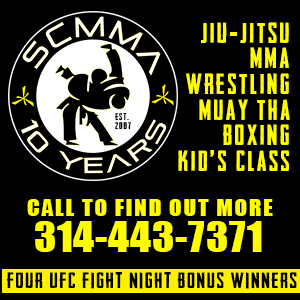 Saturday's card will feature amateur fighters from Fort Leonard Wood Army Combatives, Berger's MMA, Rob Howard's Capital Punishment, St. Charles MMA, Cuba Missouri's Smith Pit, Flying Dragon, and Fearless Fighters. "We're getting back to the days when we had the Lance's and Ricehouse's on the card," Smith said. "I want to see these guys get to the next level." In the main event, heavyweight prospect Nick Pholman (5-0) will bring his undefeated record into the cage when he takes on Travis Edwards (10-4). Although the local heavyweight division is pretty thin, this is a compelling match-up of two of Spire's top-rated heavies of which Pohlman looks to be a rising star. In his last couple of outings, he's looked very impressive ending his fights early. Smith coaches Pohlman and believes the more experienced Edwards will be a strong test for the young fighter. "Travis is going to want to stand with him," Smith said. "He's a 6 foot 3-inch, 240-pound stand-up banger who likes to throw lots of uppercuts." They may want to reinforce the cage when these big guys begin throwing heavy leather. In the co-main event, Richie Fernow looks to continue his winning ways against Garrett Mueller. Fernow had a great year in 2012 with wins over AJ Siscoe, Wil Alfaro, and Cody Janish with his only loss coming to Charles Johnson in June. Fernow also saw the birth of a baby girl and took time away from training in the early part of the year. He'll need to be on top of his game when he climbs into the cage against opponent Mueller. Mueller trains under Rob Howard out of Jefferson City and wants to leap past Fernow in the Spire rankings as he looks to improve upon his 8-4 record. .
"His guys are usually pretty tough," Smith said. "All of Rob Howard's guys come to fight. They're going to put on a show." 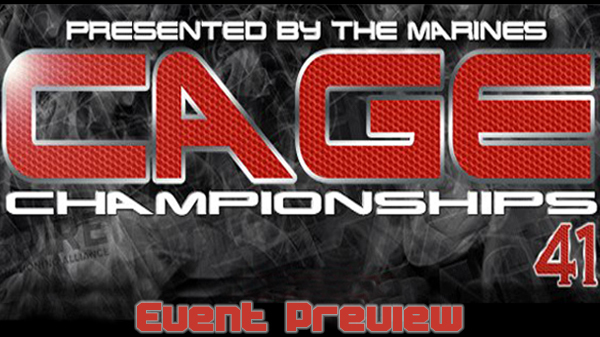 If an opponent can be found, Heath Hildebrand from Pedigo Submission Fighting will also be featured on the main card. The highly touted Hildebrand has has a tough time finding opponents as of late, and is eager to get back into the cage. Headlining the undercard is local favorite Bo Kunz. The veteran Kunz likes to fight a lot and had a very busy year in 2012. Since December he's switched camps, and has moved his training a little closer to home at St. Charles MMA. He will be taking on William Bagby. "Both have similar styles. They're going to stand and beat each other senseless," Smith said. "This could be the showstopper." The always-tough Kunz has an incredible chin and has only been stopped once. Bagby is coming off a 13-second KO this past October. "That whole mid card, I don't know who's going to win those fights," Smith said. "But the fight you want to watch: Bo Kunz and William Bagby." Another fighter that has migrated recently to St. Charles is Joe Roye. He will be taking on Justin Lankford, a very tough grappler from Berger's MMA. Lankford last saw action against Shaine Moffitt. "(Roye) is very athletic, very explosive," Smith said. "That will be an exciting fight." Smith is obviously very proud of the fight card he's assembled and is focused on getting local guys some cage time. "The undercard has potential guys that once they get some training under their belt are going to be very tough," Smith said. Cage Champs offers a very family friendly event at the Big Eagles and is just a short drive west down I-44 in Sullivan. Smith believes he offers something that the bigger promotions can't. "You got $20 seats for a good card and parking is free." Smith said. "Also my beers aren't $8."